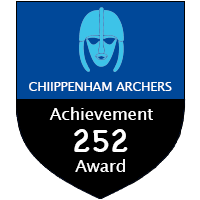 When you arrive at the range having decided to shoot a 252 scheme you shoot 6 Arrows as Sighters (these are the first 6 arrows you shoot at that distance). followed by 3 Dozen scoring arrows (in ends of 6) - Scoring is 5 zone scoring; Gold = 9, Red = 7, Blue = 5, Black = 3, White = 1. 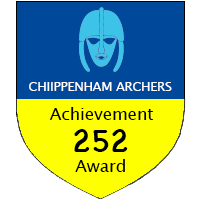 The 3 Dozen arrows may be shot alone or as the first 3 Dozen of a distance in a Round - Distance claims may be made in any order. 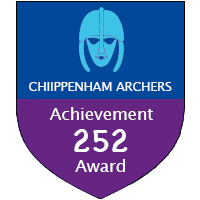 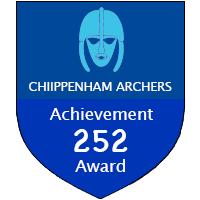 Claiming a Badge :- To make a claim a signed and witnessed 252 score sheet needs to be submitted to the clubs Record Officer who will administer the Scheme.